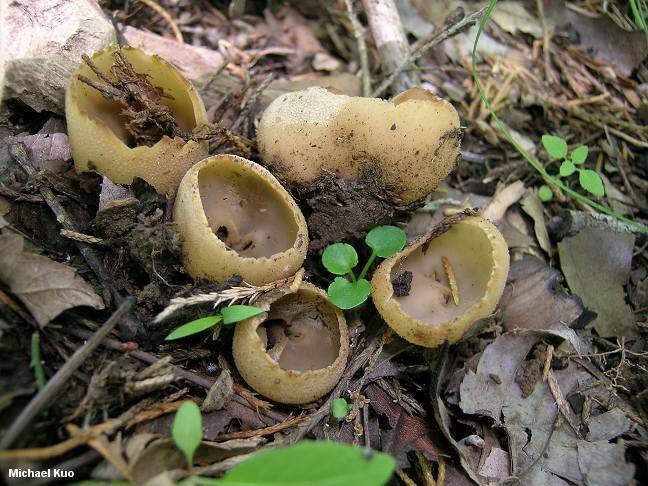 Tarzetta bronca is a yellowish, goblet-shaped cup fungus that probably requires a microscope for certain identification; see the key to cup fungi for details. It looks rather like a species of Peziza, but its ascus tips do not turn blue in Melzer's reagent. The similar Tarzetta catinus has a fairly prominent stemlike structure, while Tarzetta cupularis is similar but smaller. Tazzetta bronca is a synonym. Ecology: Uncertain; one recent investigation (Tedersoo and collaborators, 2006) suggests that at least some species of Tarzetta are mycorrhizal; growing alone, gregariously, or in small clusters; terrestrial; found under conifers or hardwoods; summer; widely distributed in North America. Fruiting Body: Goblet-shaped from youth to maturity; 1-4 cm across; upper/inner surface smooth, creamy to yellowish, yellow, or occasionally olive buff; outer surface hairy to mealy or granular; creamy to yellowish or yellow; the margin often densely hairy or jagged; usually without a stem or pseudostem, but occasionally with a pinched-together base; odor not distinctive; flesh pale. Microscopic Features: Spores elliptical; smooth; hyaline; of two types, according to Kanouse (1950): 20-24 x 12-13 µ, with 1-2 large oil droplets; and 12-14 x 8-9 µ, with 2 small oil droplets (my collection demonstrated this "heterosporous condition," but I also noticed spores intermediating between the two types). Paraphyses variable: with slightly thickened tips, with lobed or forked tips, or with hydra-like tips. Tips of asci not bluing in Melzer's reagent. REFERENCES: (Peck, 1875) Korf & J.K. Rogers, 1971. (Saccardo, 1889; Seaver, 1928; Kanouse, 1950; Smith, Smith & Weber, 1981.) Herb. Kuo 05120703, 06100801. Kuo, M. (2007, August). Tarzetta bronca. Retrieved from the MushroomExpert.Com Web site: http://www.mushroomexpert.com/tarzetta_bronca.html.